It’s a pernicious disease; I cannot seem to pass by a yarn sale or a crafting convention without ogling piles of beautiful “yarms.”..and when it comes to being able to say “no” to donations of yarn and notions from friends cleaning out their own stashes, I have no willpower whatsoever. In addition to Knit-itis, I appear to have contracted a crippling case of Rip-it-osis. Symptoms are characterized by ripping out nearly-complete works back to the start stage, due to perceived imperfections in the work. 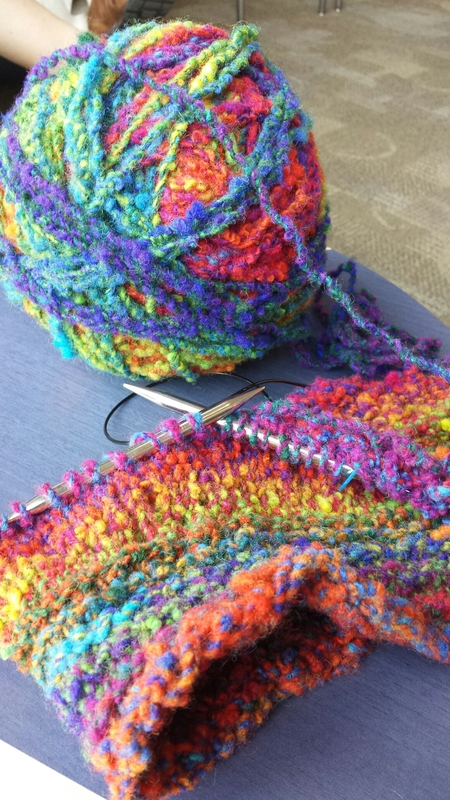 This annoying condition appears fairly consistently when a project is nearing the completion stage, which means that I never seem to finish any of my knitting projects. 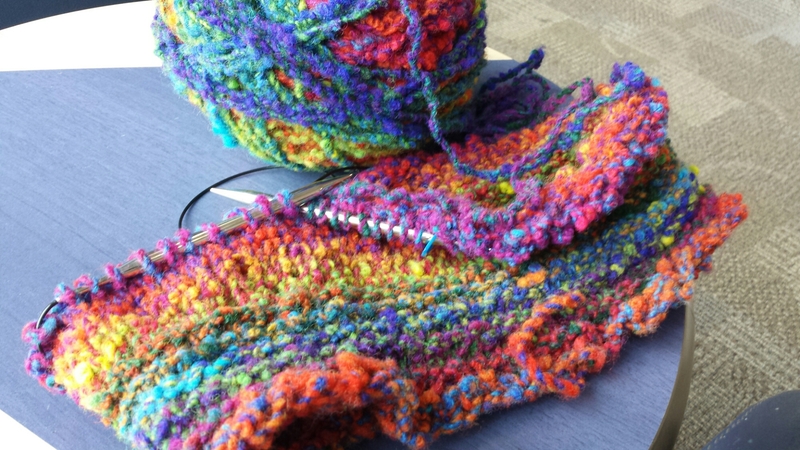 Well, I ripped out the original work I was making with my Noro Wadaiko yarn last month, and am in the laborious process of starting again, but this time with a new project in mind. Behold my new neck cowl! Or at least the start of it. It’s not exactly what I had intended (I picked up the wrong gauge of circular needle and didn’t notice until yesterday), but I think my revised idea will turn out very well! It’s nearly 1/2 done at this point; the idea is to pop it over my head and fold it over so the smooth side is against my neck, or I can “ruche” it down depending on the coat I’m wearing. It’s certainly going to be both warm and bright! It’s only my second time using circular needles, and I must say I’m hooked; I am looking forward to doing my next pattern with them too! The important thing is for me to finally complete one of my projects; this may get me over this apparent fear of completing things. Rip-it-osis will not get the better of me; if I can’t complete projects I can never give away my creations, and then I’m left with a growing pile of frogged yarn, which is such a waste. Previous Post …A flame about *this* high?